The Wall Street private equity company Warburg Pincus announced November 16 that Timothy Geithner, treasury secretary under President Obama from 2009 until last January, will join the firm as president and managing director beginning March 1, 2014. With this move, Geithner joins the legions of bank regulators and officials who have leveraged their insider status while in government to land positions in private finance paying millions in salaries and bonuses. Last July, Robert Khuzami, enforcement chief at the Securities and Exchange Commission (SEC) from 2009 to January of 2013, joined the elite corporate law firm Kirkland & Ellis as a partner. Prior to taking the SEC post, Khuzami was a top lawyer at Deutsche Bank. In May, the private equity firm KKR & Co. hired David Petraeus, the former commander in Iraq and Afghanistan and Central Intelligence Agency chief. Former Vice President Dan Quayle and former Treasury Secretary John Snow work for Cerberus Capital Management LP. The New York Times reported on November 12 that the last six SEC enforcement chiefs have moved on to lucrative jobs at major corporations and big banks such as JPMorgan Chase and Bank of America. Stephen Cutler, chief counsel at JPMorgan, headed up the enforcement division at the SEC earlier in the decade. In Geithner’s case, the progression is from a Wall Street insider in the public sector to a Wall Street operative on the private side—or, to put it differently, from a trusted agent of the financial aristocracy to a bona fide member of the club. 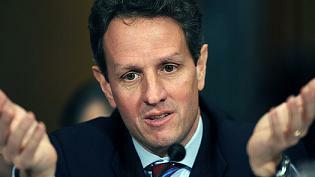 Prior to becoming Obama’s treasury secretary in 2009, Geithner was president of the Federal Reserve Bank of New York for six years. That was the period when Wall Street made hundreds of billions of dollars by turning the US housing market into a Ponzi scheme, on the basis of high-risk sub-prime mortgages and toxic mortgage-backed securities. As head of the New York Fed, Geithner played a key role in facilitating the inflation of the housing and credit bubble, with all of the associated fraudulent practices. The bubble burst in September 2008, ushering in the worst economic crisis since the Great Depression. Together with Bush Treasury Secretary Henry Paulson and Federal Reserve Chairman Ben Bernanke, Geithner engineered the initial $700 billion bailout of the banks (in the form of the Troubled Asset Relief Program—TARP) and the rescue, with public funds, of insurance giant American International Group (AIG). Subsequent investigations have revealed that as part of the bailout, Geithner, along with Paulson and Bernanke, secretly used over $62 billion in taxpayer funds to cover, dollar for dollar, the losses of the major Wall Street banks on credit default swaps that AIG was unable to honor. This was the man Obama chose to become his treasury secretary, sending an unmistakable signal to the American financial aristocracy that his administration’s number one priority would be protecting and expanding the wealth of the rich and the super-rich. During his confirmation, it was disclosed that Geithner had failed to pay $35,000 in Social Security and Medicare payroll taxes from 2001 through 2004. That did not prevent him from sailing through the confirmation process. As treasury secretary, Geithner expanded the bailout of the banks and finance houses. He announced a new plan to underwrite the profits of Wall Street in March of 2009. That plan, together with his defense of AIG bonuses and opposition to legislation to limit the pay of bailed-out firms’ executives, sparked a stock market rally that has continued ever since, propelling the Dow to record heights and more than doubling its value. At the same time, Geithner played a key role in the forced bankruptcy of General Motors and Chrysler in the spring of 2009, imposing tens of thousands of layoffs and slashing the wages of all newly hired workers by 50 percent. The attack on wages and benefits at GM and Chrysler was the signal for a nationwide wage-cutting assault on workers. When the Libor-rigging scandal erupted in 2012, it was revealed that as early as 2007 Geithner knew that London-based Barclays Bank was submitting false information to the Libor board, which sets the benchmark interest rate for the world economy. Though such manipulation compromised the global rate to which hundreds of trillions of dollars of financial contracts are tied, Geithner merely wrote to the Bank of England suggesting changes in the Libor rate-setting mechanism, but made no public statement and did not notify US regulatory agencies. Geithner’s new home, Warburg Pincus, like most private equity firms, makes money by buying companies on credit, cutting costs and jobs and stripping assets, and selling off the downsized firms for a profit. It bought the eye-care firm Bausch & Lomb in 2007 and sold it this year after eliminating hundreds of jobs. That Sorkin considers salaries of $200,000 to $400,000 to be modest illuminates the elite social layers for which he and the Times speak.